رحمانی, بهروز, نغمه سنج, محمدرضا. (1394). کنترل زمان‌گسسته و مقاوم ارتعاشات عرضی تیر مدرج تابعی دارای سطح مقطع متغیر. علوم و فناوری کامپوزیت, 2(2), 17-30. بهروز رحمانی; محمدرضا نغمه سنج. "کنترل زمان‌گسسته و مقاوم ارتعاشات عرضی تیر مدرج تابعی دارای سطح مقطع متغیر". علوم و فناوری کامپوزیت, 2, 2, 1394, 17-30. رحمانی, بهروز, نغمه سنج, محمدرضا. (1394). 'کنترل زمان‌گسسته و مقاوم ارتعاشات عرضی تیر مدرج تابعی دارای سطح مقطع متغیر', علوم و فناوری کامپوزیت, 2(2), pp. 17-30. رحمانی, بهروز, نغمه سنج, محمدرضا. کنترل زمان‌گسسته و مقاوم ارتعاشات عرضی تیر مدرج تابعی دارای سطح مقطع متغیر. علوم و فناوری کامپوزیت, 1394; 2(2): 17-30. In this paper, robust vibration control of a thin functionally graded beam with a variable cross-section has been investigated. For this purpose, piezoelectric patches are used as sensors to measure the displacement of the beam and as actuators to apply control forces. In this way, firstly, Euler-Bernoulli theory is used to derive the governing dynamical partial differential equation, through the Hamilton’s principle. Approximate solution of these equations is achieved using finite difference method, and the proper orthogonal decomposition is then used to obtain vibration mode shapes. After that, time-dependent ordinary differential equations are attained using Galerkin projection scheme and then represented in the state-space form. Since the data measurement is done in sampling intervals, the system is considered as sampled-data. In this way, direct digital control design methodology is used. For this purpose, based on its zero-order hold equivalent model, a robust discrete-time, observer-based, output feedback controller is designed. In this regard, controller and observer gains are designed by a Lyapunov-based method. This procedure is done by solving a set of linear matrix inequalities. Simulation studies show the effectiveness of the proposed method. Wang, G., “Coupled free vibration of composite beams with asymmetric cross-sections, Composite Structures”, Vol. 100, pp. 373-384, 2013. Ece, M. C. Aydogdu, M. and Taskin, V., “Vibration of a variable cross-section beam”, Mechanics Research Communications, Vol. 34, pp. 78–84, 2007. Kapuria, S. and YaqoobYasin, M., “Active vibration control of piezoelectric laminated beams with electroded actuators and sensors using an efficient finite element involving an electric node”, Smart Materials and Structures, Vol. 19, No. 4, 2010. Shin, C. Hong, C. and Jeong, W. B., “Active vibration control of beams using filtered-velocity feedback controllers with moment pair actuators”, Journal of Sound and Vibration, Vol. 332, pp. 2910–2922, 2013. Shin, C. Hong, C. and Jeong, W. B., “Active vibration control of beam structures using acceleration feedback control with piezoceramic actuators”, Journal of Sound and Vibration, Vol. 331, pp. 1257–1269, 2012. Marinaki, M. Marinakis, Y. and Stavroulakis, G. E., “Vibration control of beams with piezoelectric sensors and actuators using particle swarm optimization”, Expert Systems with Applications, Vol. 38, pp. 6872–6883, 2011. Su, Z. Jin, G. Shi, S. Ye, T. and Jia, X., “A unified solution for vibration analysis of functionally graded cylindrical, conical shells and annular plates with general boundary conditions”, International Journal of Mechanical Sciences, Vol. 80, pp. 62–80, 2014. Hein, H. and Feklistova, L., “Free vibrations of non-uniform and axially functionally graded beams using Haar wavelets”, Engineering Structures, Vol. 33, pp. 3696–3701, 2011. Huang, Y. and Li, X. F., “A new approach for free vibration of axially functionally graded beams with non-uniform cross-section”, Journal of sound and vibration, Vol. 329, pp. 2291–2303, 2010. Huang, Y. Yang, L. E. and Luo, Q. Z., “Free vibration of axially functionally graded Timoshenko beams with non-uniform cross-section”, Composites: Part B, Vol. 45, pp. 1493–1498, 2013. Kargarnovin, M. H. Najafizadeh, M. M. and Viliani, N. S., Vibration control of a functionally graded material plate patched with piezoelectric actuators and sensors under a constant electric charge, Smart Materials and Structures, Vol. 16, pp. 1252–1259, 2007. Shariyat, M. “Vibration and dynamic buckling control of imperfect hybrid FGM plates with temperature-dependent material properties subjected to thermo-electro-mechanical loading conditions”, Composite Structures, Vol. 88, pp. 240–252, 2009. Bruant, I. and Proslier, L., “Improved active control of a functionally graded material beam with piezoelectric patches”, Journal of Vibration and Control, 2013. Rahmani, B. and Gholami, F., “Robust vibration control of a functionally graded cracked beam,” In Persian, Journal of Science and Technology of Composites, Accepted paper. Jalili, N., “Piezoelectric-Based Vibration Control”, pp. 180-215, Springer, 2010. 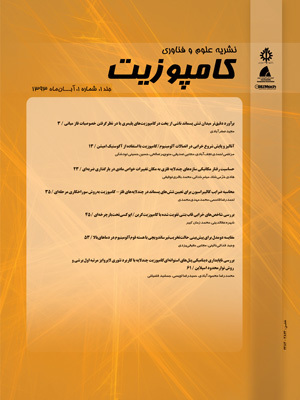 Rahmani B., Moosaie, A. and Mansourian Tabaie, A., “Distributed control of nonlinear Burger’s equation”, In Persian, Modares Mechanical Engineering, Vol. 15, NO. 4, pp. 214-220, 1394. Emdad, H., Mostofizadeh, A. R. and Mousavinia, S. A., “Optimal control of vortex shedding around square cylinder via reduced order model”, In Persian, Modares Mechanical Engineering, Vol. 13, NO. 5, pp. 53-55, 1391. Sirovich, L., “Turbulence and the Dynamics of Coherent Structures. Part 1: Coherent Structures”, Quarterly of Applied Mathematics, Vol. 45, pp. 524-529, 1987. Franklin, G.F. Powell, J. D. and Workman, M.L., “Digital Control of Dynamic System”, Third Edittion, Addison-Wesley, 1997. Ibrir, S. and Diopt, S., “Novel LMI conditions for observer-based stabilization of Lipschitzian”, Applied Mathematics and Computation, 2008. Li, L. Song, G. and Ou, J., “Adaptive fuzzy sliding mode based active vibration control of a smart beam with mass uncertainty”, Structural control and health monitoring, Vol. 18, pp. 40-52, 2011.